In Dothan, Alabama, runners get many chances throughout the year to race on the Larry and Rona Dykes Trail in Westgate Park. Among other chances, there is the Mardi Gras 5K Trail Run in the winter, the Bryan Dowling Memorial 5K Run in the spring, the Life Is A Beach 5K Trail Run in the summer, and the Pilgrim Chase 5K Trail Run in the fall. But as the year winds down, the opportunities run out, and in late December only the last chance of all is left--the annual Last Gasp 5K Trail Run. In 2012 the Last Gasp came on Saturday morning, December 29. 65 runners took advantage of Dothan's last racing date of the year. After finishing runner-up to Cairo's Stephen Robbins in the 2011 Last Gasp, Northview High senior Sean Kent was victorious in 2012, finishing over 400 meters ahead of the next runner in 17:59. Midland City master runner Jeff Dasinger ran 19:38 to place second, significantly faster than his seventh-place 20:18 that he ran at the previous year's Last Gasp. 24:48 to 24:50. The two runners finished 12th and 13th overall. After Dothan's last race in 2012, it's natural to wonder about the city's first race in 2013. That will be the 31st annual Hog Wild Run on Saturday afternoon, 26 January 2013, at 2:00 PM CT. After being contested at five miles from 1983 to 2009, the event is now a 15K and a 5K, both staged from the Depot Off Main near downtown Dothan. The course record in the 15K is 58:41, set in the 2012 Hog Wild by Cedric Gillette. Biggest Loser Half Marathon and 5K. 7:00 AM CT. Pier Park, 600 Pier Park Drive, Panama City Beach, Florida. Event web site. Online registration at active.com. Valdosta New Year's Eve 5K. 9:00 PM ET. Lowndes High School, 1606 Norman Drive, Valdosta Georgia, 31601. Entry form and flyer. Register online at RunSignUp.com. A Course/Line, LLC, acourseline@earthlink.net or 229-630-1455. 5K Benefit Run for K9s for Warriors. 9:00 AM CT. Albany Marine Logistics Base, 814 Radford Blvd, Albany, Georgia. Online registration at active.com. Butterfly 5K. 8:00 AM ET. Winn Dixie parking lot, 3200 North Ashley Street, Valdosta, Georgia 31602. Event page on Facebook. 4th annual Red Fox Trot 5K and one-mile fun run. 8:00 AM ET 5K / 9:00 AM ET one mile.Roberts Elementary School, 5777 Pimlico Drive, Tallahassee, Florida 32309. 2012 story. 2011 story. Entry form and flyer. Kim Vinson, ksvinson@embarqmail.com or 850-488-0923 or 850-668-7430. 9th annual Kiwanis River Run 10K / 5K. 9:00am ET. Earle May Boat Basin, 100 Boat Basin Circle, Bainbridge, Georgia 39817. 2012 story. 2011 story. 10K is on USATF certified course GA05001WC. Entry form and flyer. Online registration at active.com. Lance Wilson, lance.wilson096@cottonstates.com or 229-400-5854. School of Arts and Sciences Dragon Dash 5K and one-mile fun run. 9:00 AM ET one mile / 9:30 AM ET 5K. Maclay Gardens State Park, 3540 Thomasville Road, Tallahassee, Florida 32309. Entry form and flyer. Kate Taluga, talugak@leonschools.net or 850-386-6566. 2nd annual House of Hope 5K and one-mile fun run. 8:00 AM CT. First Baptist Church, 640 Grace Avenue Panama City, Florida.Online registration at active.com. Run 4 Missions Four-Mile Run and one-mile fun run. 8:00 AM ET. Baptist Student Center, 1522 North Oak Street, Valdosta, Georgia. Event web page. Online registration at RunSignUp.com. 4th annual FSU First Responder Unit 5K. 9:00 AM ET. Integration Statue on Woodward Plaza, Florida State University, Tallahassee, Florida. 2012 story. 2011 story. 2010 story. Entry form and flyer. FRU@admin.fsu.edu or 850-644-3349. Purple Heart 5K. 9:00 AM ET. Bainbridge College, 2500 East Shotwell St. Bainbridge Georgia. Event page on Facebook. Entry form and flyer. Contact Eric Dueno, eric.dueno@bainbridge.edu or 229-248-2577, or Marcus Starling 850-766-9504. 4th annual ABAC Fitness Festival 5K and one-mile fun run. 9:00am ET. Red Hills Tennis Complex, Abraham Baldwin Agricultural College, Perimeter Road, Tifton, Georgia. 2011 story. Event web page. Entry form and flyer. Register online. Cindy Epperly, cepperly@abac.edu or 229-391-5082. Saint Teresa's School Nun Run 5K and One-Mile Fun Run. 8:30am ET. Saint Teresa's School, 417 Edgewood Lane, Albany, Georgia 31707. 2011 story. Saint Teresa's School web site. Online registration at active.com. Heels for Hope 5K and one-mile fun run. 8:00 AM CT. Boll Weevil Monument, 121 North Main Street, Enterprise, Alabama. Online registration at active.com. 2nd annual Soaring Eagle 5K. 9:00am ET. Community Christian Academy, 218 East 8th Street, Adel, Georgia. 2012 story. Apple Classic 10K and 5K. 8:00 AM CT. 74 Great Hammock Bend Freeport, Florida. Event web site. Online registration at active.com. Black History 5K. 9:00 AM CT. Fortenberry-Colton Physical Fitness Facility, 5900 Skychief Street, Fort Rucker, Alabama 36362. 334-255-2296. 21st annual Run For The Cookies 5K and one-mile fun run. 8:30AM ET one mile / 9:00AM ET 5K. Tallahassee Community College Lifetime Sports Center, 444 Appleyard Drive, Tallahassee, Florida 32304. 2011 story. 2010 story. USATF certified 5K course FL08011EBM. Event page on Facebook. Entry form and flyer. Dr. Jeanne O'Kon, okonj@tcc.fl.edu or 850-894-2019. 2nd annual Southeast Alabama Community Foundation's 2013 Half Marathon and 5K. 8:00 AM CT. Flowers Hospital 4370 West Main Street, Dothan, Alabama. Event web page. Online registration at active.com. Jog With The Generals 5K and one-mile fun run. 8:00 AM ET 5K / 9:00 AM ET 9:00 AM ET. Georgia Christian School, 4359 Dasher Road, Valdosta, Georgia. Entry form and flyer. Online registration at RunSignUp.com. 3rd annual Hospice Half Marathon & Dewey Dash 5K color run. 7:00 AM ET. Georgia Christian School, 4359 Dasher Road, Valdosta, GA 31601-2101. 2011 story. Event web site. Online registration at active.com. Leanna Greene, hospicehalfanddash@gmail.com or 229-563-7676. Hot Cocoa 15K, 10K, and 5K. 9:00 AM CT. Beacon Hill Park, St. Joe Beach, Florida. Online registration at active.com. There's No Place Like Home 5K. 8:00 AM CT. Madison Street Park, 2884 Madison Street, Marianna, Florida. Event web page. Strides For Scholars 5K. 8:00 AM CT. Nelson Building, 1311 Balboa Avenue, Panama City, Florida. Event web page. Miles For Madison 5K. 8:00 AM CT. Mosley High School, 501 Mosley Drive, Lynn Haven, Florida. Online registration at active.com. 4th annual Florida Sheriff's Youth Ranches, Marathon, Half Marathon, 10K, and 5K. 7:40am ET. Florida Sheriff's Youth Ranch, 1813 Cecil Webb Place, Live Oak, FL 32060. USATF certified course FL10028EBM (Marathon and half-Marathon), Event web page. Online registration at active.com. Chris Carusone, 941-799-7184. 3rd annual Doggie Dash 8K, 5K, and one-mile fun run. 8:00 AM ET. Southwood Central Park, Grove Park Drive at Terrebone Drive, Tallahassee, Florida. 2012 story. 2011 story. Chris Akins or Sheri Logue, kgalban@southernscholarship.org or 850-717-3714. St Patrick's Day 10K and 5K. 9:00 AM CT. Fort Rucker Physical Fitness Facility, Bldg 4605 Andrews Avenue, Fort Rucker, Alabama, 36362. 334-255-2296. Gulf Winds Track Club's 38th annual Springtime 10K, Publix 5K and Target 1-Miler. 7:45am ET one-mile / 8:10am ET 10K and 5K. Leon County Courthouse, 301 S Monroe St, Tallahassee, FL 32301. 2012 story. 2011 story. 2010 story. 2009 story. Event web site. Entry form and flyer. Online registration at active.com. Judy Alexander, jalexander98@comcast.net or 850-383-1361. 2nd annual Run For The Nurses Half Marathon, 5K, and one-mile fun run. 8:00 AM ET. Red Hills Tennis Complex, Abraham Baldwin Agricultural College, Perimeter Road, Tifton, Georgia. Event web page. Online registration at active.com. 3rd annual Tomato Trot 5K. 11:00 AM ET. Tallahassee Auto Museum, 6800 Mahan Drive, Tallahassee, Florida 32308. 2012 story. Online registration at active.com. 12th annual Tallahassee Tails and Trails 10K, 5K, and one-mile fun run. 8:30 AM ET. Tallahassee-Leon County Animal Service Center, 1125 Easterwood Drive, Tallahassee, Florida 32311. 2012 story. 2011 story. 2010 story. 2009 story. Event web site. Army Ten Miler. 7:00 AM CT. Fort Rucker Physical Fitness Facility, Bldg 4605 Andrews Avenue, Fort Rucker, Alabama, 36362. 334-255-2296. Gulf Winds Track Club's 16th annual Breakfast On The Track One Mile Run. 7:45 am ET. Maclay School track, 3737 N Meridian Rd, Tallahassee, Florida. 2012 story. 2011 story. 2010 story. 2009 story. Bonnie Wright, bonniedwright@gmail.com or 850-386-3500. Gulf Winds Track Club's Miller Landing Madness 8K/5K/3K. 8:00 am ET. Elinor Klapp Phipps Park, Miller Landing Road, Tallahassee, FL 32312. 2012 story. 2011 story. 2010 story. 2009 story. Tom Perkins, 850-894-2019. Gulf Winds Track Club's 32nd annual Tallahassee Women's Distance Festival 5K. 8:00am ET. Optimist Park, East Indianhead Drive, Tallahassee, Florida. 2012 story. 2011 story. 2010 story. 2009 story. USATF certified course #FL00022DL. Entry form and flyer. Lisa Unger, ungertl@juno.com or 850-562-2901. 34th annual Boston Mini-Marathon. 8:00 am ET. Commercial Bank, 124 West Jefferson Street, Boston, GA 31626. 2012 story. 2011 story. 2010 story. 2009 story. Brad Johnson, bradjohnson@bankcb.com or 229-498-8500 (day) / 229-226-4679 (evening). 19th annual Draggin' Tail 18-Mile Run, Relay, and 5K. 8:00 am CT. St Theresa's Catholic Church, 2056 Sunny Hills Boulevard, Sunny Hills, Florida. 2012 story. 2011 story. 2010 story. Marty Kirkland 850-265-8439 or Joe Edgecombe joeruns@yahoo.com or 850-763-5005. When planning their second annual Red Nose Run, the Thomasville, Georgia Junior Service League did just about everything right. In addition to bringing back the 5K from 2011, they added a half marathon, currently one of the hottest distances on the racing circuit. To make sure that runners would have meaningful performances in the race, they had the half-marathon course USATF certified, assuring that it was an accurate 13.1 miles long. For good measure, the 5K course was also certified. But on the morning of the race, Saturday, 15 December 2012, the plans fell short when the competitors were turned around early on the out-and-back half-marathon course, failing to run far enough south on Metcalf Road. The course was accurate, but the athletes didn't run the course. As one of the disappointed runners put it, "I ran a twelve-mile half marathon this morning." However abbreviated, the long event at Red Nose Run was still a race, and Tallahassee triathlete Charlie Johnson won that race, clocking a 73:51 for whatever the distance was. At 75:14, Drew Rabun of Savannah followed Johnson over the line in the runner-up position, while Tallahassee's Eric Godin was third in 77:21. Fourth place and the top master spot went to Derek Larson of Columbus, Georgia in 80:56. Savannah, Georgia runner Sarah Batt was the first woman as well as the first woman master, placing ninth overall in 83:05. 96 athletes completed the abbreviated half marathon. No wrong turns marred the 5K. In a battle of high school distance runners, Leon HS freshman Charlie Lang edged out Thomas County Central HS sophomore Terrence Smith for the win, 21:04 to 21:08. Valdosta master runner Rick Mazurkiewicz was third in 21:11. Another high school distance runner, Maclay School sophomore Lindsey Poole, was the first female finisher in the 5K, running 23:41. At 23:58 Thomasville's Nancy Herring was the first female master and second female finisher. 349 runners finished the 2012 Red Nose Run 5K, up from 272 in the 2011 race. 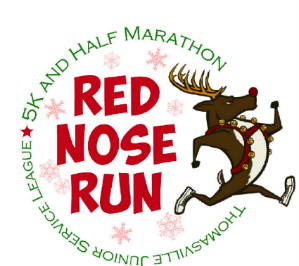 2011 story, "No Rudolph here; Robbins and Horne win Red Nose 5K"